This game can be played with three or more participants. One player acts as host, and the other players are contestants. Each contestant should have a playing piece, such as a small toy, a coin, or an eraser. The host selects three flash cards and looks at the correct answer of one of them. Then the host places the three flash cards down in front of the contestants, at an equal distance from each contestant. The host calls out the correct answer of one of the flash cards, and the first contestant to correctly place his or her playing piece on the flash card showing the equation that leads to the correct answer wins the card. The contestant with the most cards at the end wins. The host can increase the number of flash cards to choose from in each round to make the game more challenging. This game can be played with multiple participants. Lay out flash cards on the ground with the answer sides down. Find a bean bag, and toss the bean bag onto the flash cards. Solve the equation on the card on which the bean bag landed. If you get it right, keep the card. Take turns with other players until all of the cards have been solved. The player with the most cards wins. This game can be played with multiple participants. Set up markers on the ground, such as pieces of tape, tiles, scrap paper, or pencils, to create a path with a finish line. All players should begin at the first marker. Each player takes turns answering flash card equations. If a player answers one correctly, he or she moves forward to the next marker. The player to reach the finish line first wins. Ask a partner to hide flash cards in a room while you are not looking. Then, try to find them. When you find one card, you must solve it correctly before moving on to find the next card. Put on a timer for an extra challenge. Once you have found and solved all of the cards or the timer runs out, switch with your partner and play again. This game can be played with a partner. Each player should place nine flash cards in a grid, three rows of three cards each, with the answer sides down. Take turns solving one equation in your grid at a time. If you get it right, flip the card over. Try to get three in a row for tic tac toe. Enhance any board game with flash cards. Before each turn, the player must correctly solve a flash card equation. If he or she gets it right, the turn progresses as normal. If he or she gets it wrong, the turn passes to the next player. Take it slow at first. 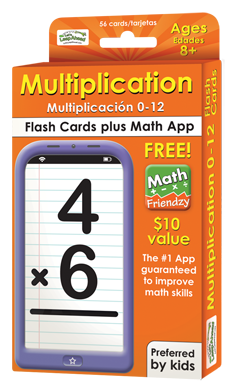 Students may need assistance in learning how to use flash cards to test their skills. Offer help when needed. 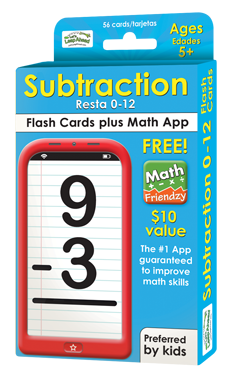 If a student is stuck on a particular flash card, provide the answer before the student becomes too frustrated. 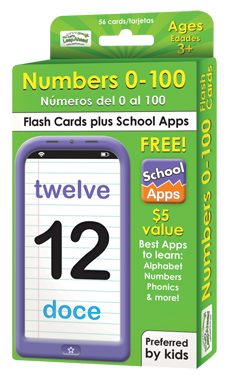 Take flash cards with you on the go. Waiting in line, sitting in the car, going to an appointment-these are all excellent opportunities for practice time. Keep it short and fun. Students learn over time, so they will benefit more from periodic short practice sessions than one long session. Customize your approach to accommodate your student's learning style. For instance, kinesthetic students might enjoy tossing a ball back and forth between each flash card. Auditory students might enjoy creating songs out of the flash cards. 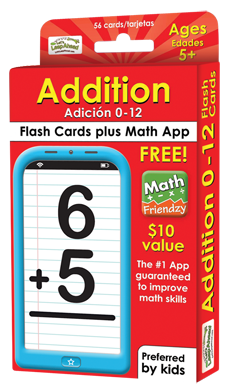 Use the Math Friendzy app for more engaging practice. Doing drills on a computer or tablet helps students learn in an interactive online environment. This game can be played with a partner. Ask your partner to place three flash cards in front of you. You should look at all three cards for one minute and try to remember them. Then, your partner should remove one of the cards while you are not looking. Look again-can you remember which card is now missing? Switch with your partner and play again. This game can be played with multiple participants. Lay out the counting set flash cards on the ground with the answer sides down. Find a bean bag, and toss the bean bag onto the flash cards. Count the pictures on the card on which the bean bag landed. If you get it right, keep the card. Take turns with other players until all of the cards have been correctly counted. The player with the most cards wins. This game can be played with multiple participants. Set up markers on the ground, such as pieces of tape, tiles, scrap paper, or pencils, to create a path with a finish line. All players should begin at the first marker. 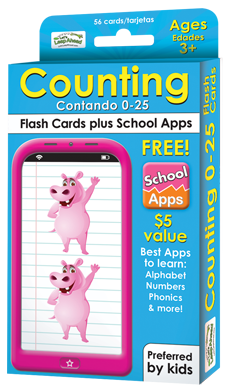 Each player takes turns counting the pictures on a flash card or identifying a number. If a player answers one correctly, he or she moves forward to the next marker. The player to reach the finish line first wins. Ask a partner to hide counting set flash cards in a room while you are not looking. Then, try to find them. When you find one card, you must count the pictures on it correctly before moving on to find the next card. Put on a timer for an extra challenge. Once you have found and counted all of the cards or the timer runs out, switch with your partner and play again. Enhance any board game with flash cards. Before each turn, the player must correctly count the pictures on the card or identify the number. If he or she gets it right, the turn progresses as normal. If he or she gets it wrong, the turn passes to the next player. Choose a random group of numeral flash cards from the set. Sort the numbers into odd or even. For a challenge, sort all of the numbers from 0 to 25. This game can be played with multiple participants. Lay out the flash cards on the ground. Find a bean bag, and toss the bean bag onto the flash cards. Say the number on the card on which the bean bag landed. If you get it right, keep the card. Take turns with other players until all of the cards have been correctly named. The player with the most cards wins. This game can be played with multiple participants. Set up markers on the ground, such as pieces of tape, tiles, scrap paper, or pencils, to create a path with a finish line. All players should begin at the first marker. Each player takes turns identifying the number on a flash card. If a player answers one correctly, he or she moves forward to the next marker. The player to reach the finish line first wins. Ask a partner to hide flash cards in a room while you are not looking. Then, try to find them. When you find one card, you must identify the number on it correctly before moving on to find the next card. Put on a timer for an extra challenge. Once you have found and counted all of the cards or the timer runs out, switch with your partner and play again. Enhance any board game with flash cards. Before each turn, the player must correctly identify the number. If he or she gets it right, the turn progresses as normal. If he or she gets it wrong, the turn passes to the next player. Choose a random group of flash cards from the set. Sort the numbers into odd or even. For a challenge, sort all of the numbers from 0 to 100. Show a flash card and ask the student to say the word aloud in English, Spanish, or both. Show a flash card and ask the student to use the word it shows in a sentence. Ask the student to choose two flash cards from the set. The student should look at the picture and the word describing the picture on each flash card. Then, ask the student to think of a short story using both of the words. What would happen if a hamster ate ice cream (H and I)? What if a ladybug had an umbrella (L and U)? Place three flash cards in front of the student. The student should look at all three cards for one minute and try to remember them. Then, remove one of the cards while the student is not looking. Ask the student to look again-can the student remember which card is now missing? 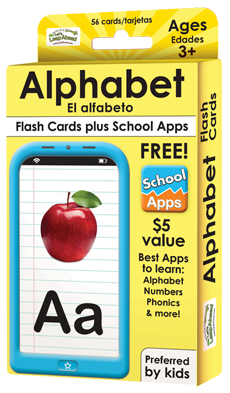 In a classroom setting, give each student a letter of the alphabet. If there are letters left over, place them spread apart in a line on the ground. Ask the students to arrange themselves from A to Z, in the correct order. They should end up in an alphabetized line (between the extra letters, if there are any). 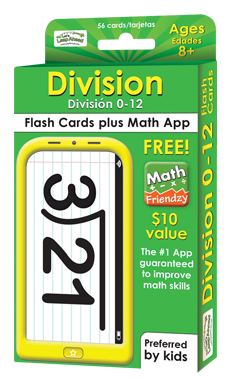 Have the student draw a card from the flash card set without showing you what it is. Then, ask the student to describe what is on the card to you without using the word. See how quickly you can guess what it is! This game can be played with multiple participants. Lay out the flash cards on the ground. Find a bean bag, and have the students toss the bean bag onto the flash cards. Ask the students to say the letter on the card on which the bean bag landed. If they get it right, they get to keep the card. Have students take turns with other players until all of the cards have been correctly named. The player with the most cards wins. This game can be played with multiple participants. Set up markers on the ground, such as pieces of tape, tiles, scrap paper, or pencils, to create a path with a finish line. All players should begin at the first marker. Each player takes turns identifying the letter on a flash card. If a player answers one correctly, he or she moves forward to the next marker. The player to reach the finish line first wins. Choose a set of flash cards, 6 to 8 at a time, and line them up with the pictures showing. Begin to describe one of the pictures without using its name. Encourage students to guess which one you are describing as quickly as they can. Students can work as a group or compete individually to keep the card if they get it right. Hide flash cards in a room while the student is not looking. Then, ask the student to find them. When the student finds one card, he or she must say the letter on it correctly before moving on to find the next card. Put on a timer for an extra challenge. Enhance any board game with flash cards. Before each turn, the player must correctly identify the letter. If he or she gets it right, the turn progresses as normal. If he or she gets it wrong, the turn passes to the next player. Choose a random group of flash cards from the set. Ask the student to sort the letters into consonants or vowels. For a challenge, ask the student to sort all of the letters in the alphabet into consonants or vowels. The student can also sort the letters from A to Z, and even Z to A. Have the student select two flash cards from the set. Ask the student to read the words and then use both of the words in one sentence. Encourage the student to be creative! Once the student can use two words in a sentence, move on to three words for a special challenge. This game can be played with multiple participants. Lay out the flash cards on the ground. Find a bean bag, and have the students toss the bean bag onto the flash cards. Ask the students to read the word on the card on which the bean bag landed. If they get it right, they get to keep the card. Have students take turns with other players until all of the cards have been correctly identified. The player with the most cards wins. This game can be played with multiple participants. Set up markers on the ground, such as pieces of tape, tiles, scrap paper, or pencils, to create a path with a finish line. All players should begin at the first marker. Each player takes turns reading the sight word on a flash card. If a player answers one correctly, he or she moves forward to the next marker. The player to reach the finish line first wins. Hide flash cards in a room while the student is not looking. Then, ask the student to find them. When the student finds one card, he or she must read the word on it correctly before moving on to find the next card. Put on a timer for an extra challenge. Enhance any board game with flash cards. Before each turn, the player must correctly read the word. If he or she gets it right, the turn progresses as normal. If he or she gets it wrong, the turn passes to the next player. Choose a random group of flash cards from the set. Ask the student to sort the words alphabetically. This game can be played with multiple participants. Lay out the flash cards on the ground. Find a bean bag, and have the students toss the bean bag onto the flash cards. Ask the students to say the word on the card on which the bean bag landed. If they get it right, they get to keep the card. Have students take turns with other players until all of the cards have been correctly identified. The player with the most cards wins. This game can be played with multiple participants. Set up markers on the ground, such as pieces of tape, tiles, scrap paper, or pencils, to create a path with a finish line. All players should begin at the first marker. Each player takes turns identifying the picture on a flash card. If a player answers one correctly, he or she moves forward to the next marker. The player to reach the finish line first wins. Choose a set of flash cards, 6 to 8 at a time, and line them up. Begin to describe one of the pictures without using its name. Encourage students to guess which one you are describing as quickly as they can. Students can work as a group or compete individually to keep the card if they get it right. Hide flash cards in a room while the student is not looking. Then, ask the student to find them. When the student finds one card, he or she must say the word on it correctly before moving on to find the next card. Put on a timer for an extra challenge. Enhance any board game with flash cards. Before each turn, the player must correctly identify the word. If he or she gets it right, the turn progresses as normal. If he or she gets it wrong, the turn passes to the next player.